You may find it helpful to keep a food journal, even if you aren’t attending nutrition consultations. They can be a real eye-opener in terms of finding out what your eating habits are really like, and can help you pinpoint areas in your diet that you need to work on. An added bonus is that when you’re forced to write down everything you eat, you might think twice before grabbing that handful of chips or nibble of chocolate. The best food journal is one that is accurate. You might want to measure your foods with measuring cups, spoons, and/or a scale for a few days so you can get an idea of how much you are actually eating, or find out what a proper serving of a certain food looks like. Once you have an idea of how much you’re supposed to eat, it will be easier to estimate how much you’re eating in places where you can’t measure your food, such as at a restaurant or a dinner party. Write down what you eat immediately after your meal or snack, instead of at the end of the day. This will ensure better accuracy, instead of having to rely on your memory of what you ate throughout the day. Go beyond just writing what and how much you ate. Record the times of your meals and snacks – do you eat consistently throughout the day, or is there a large gap between meals? Do you have more energy for your workout if you eat a snack two hours before, or a larger meal four hours before? You may also want to record the moods that trigger you to have a snack if you’re an emotional eater, or foods that trigger symptoms if you have any food sensitivities or allergies. Most importantly, review your food journals at the end of the week to help you set goals for the next week. Not eating enough vegetables? Aim to get a certain number of servings every day. Had chicken five times this week? Try other protein sources, like fish, eggs, legumes, or tofu. Felt dizzy during your workout? Try to fit in a snack a couple hours before. 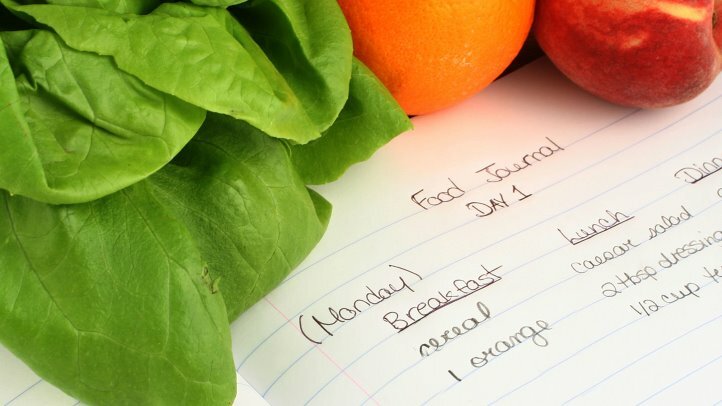 Don’t see your food journal as a chore, but as a tool to help you eat better.